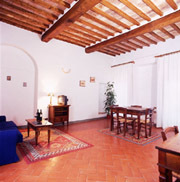 The Fattoria Guicciardini apartments are located in the very centre of San Gimignano, in Tuscany, close to the suggestive Piazza Sant'Agostino and the medieval gate of San Matteo. The holiday apartments have been created inside the farmhouse, after careful refurbishing works which have not upset the original structure. Large apartment measuring 89 m² on two storeys. Large lounge, kitchen, two double bedrooms, one of which on the upper floor, and a bathroom with bathtub. Access to a characteristic well inside the Farm. Independent entrance from Via Cellolese. 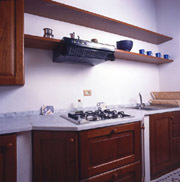 All holiday apartments have kitchen, heating and satellite colour TV. Eurostar Milano Centrale - Firenze Santa Maria Novella:2 h,40 min. Eurostar Roma Termini - Firenze Santa Maria Novella:1 h,36 min. Firenze Santa Maria Novella-Poggibonsi:50 min. From motorway A1 exit at Firenze Certosa and take the dual carriage-way towards Sie-na.Exit at Poggibonsi (34 km) and follow the indications to San Gimignano (10 km). The closest airports are “Leonardo da Vinci”at Firenze Peretola and “Galileo Galilei” at Pisa connected with the city centre and with several car-hire agencies.It takes almost 1 hour to reach San Gimignano by car from both airports.